The objects from the User Manager are listed here. If the checkbox is activated here, the corresponding button will be shown as active in the browser and can be selected for filtering. The icon, that will be used for the filtering button, is shown here. The text is shown here that will be shown instead of the icon in browsers that cannot display images. Shows a menu where objects, that are not yet defined as a filtering button, can be selected. 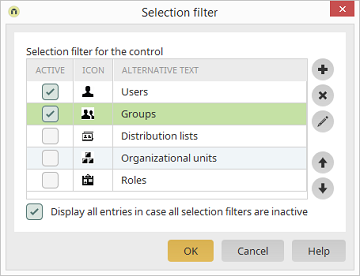 Removes the selection filter currently selected. Opens a dialog where the selection filter currently selected can be modified. Adjusts the order of the filtering buttons. If this setting is not active, no entry will be shown if all selection filters are inactive.